How do you know if someone is vegan? Well, don’t worry; they’ll just get all up in your face and f*cking tell you. And now vegan burgers are getting all up in the face of the good ol’ beef patty as they see a rapid increase in their popularity in the US as well as abroad. The most notable vegan burger would have to be the one at Impossible Foods, known as the Impossible Burger, which bleeds & browns like real meat. Big names in the burger business like McDonald’s, Red Robin, Denny’s and White Castle have also started offering the meatless option, leading to a large number of dedicated meat-eaters to convert as they slowly learn to appreciate the health benefits that a vegan burger can provide; lower fat, zero cholesterol and fewer calories go a long way in improving your quality of life than stuffing your face with a delicious & juicy beef patty...right? The issue of Nutrients on December 6, 2018 saw published the results of a study where researchers asked a group of 60 men - 20 diabetic, 20 obese and 20 perfectly healthy - to eat a vegan burger and a cheeseburger on separate days & had their physiological responses monitored after each of the meals. It was found that irrespective of the condition of their health, the men unanimously reported that they felt fuller after the vegan burger. We all knew this was bound to happen; science has joined the fight and the tides have turned. Vegan burgers apparently lead to higher production of favourable gastrointestinal hormones & enzymes that regulate “glucose metabolism, energy homeostasis, satiety, and weight management," according to the researchers. 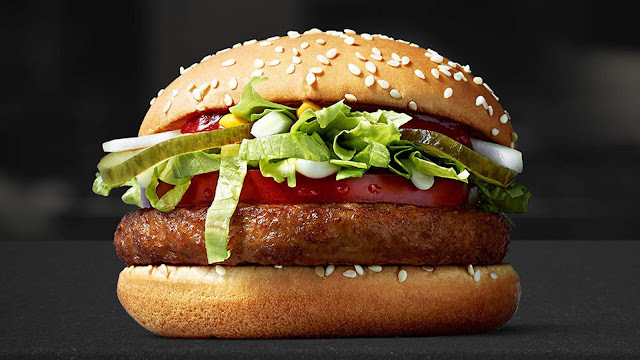 High fibre content of the vegan burger could also be a factor but most of the evidence was too vague & inconclusive to decide how fibre content affected the study overall. Even though the study showed some promise as far as vegan burgers are concerned, it had certain limitations; it was conducted considering only men and the meals were not part of a habitual diet. Branding this study sexist might make someone feel better but I don’t foresee a lot of men getting called up to participate in a survey about vegan chocolate, am I right or am I right? Jokes apart, this survey leads to an important lead in the use of vegan burgers and their ingredients to provide some kind of assistance in the treatment of diabetes & obesity. To quote the researchers,"Our findings indicate that plant-based meals with tofu may be an effective tool to increase postprandial secretion of gastrointestinal hormones, as well as promote satiety, compared to processed meat and cheese, in healthy, obese, and diabetic men," they wrote. "These positive properties may have practical implications for the prevention of type 2 diabetes." Keeping in mind how health is not valued till sickness comes and corny vegan jabs aside, eating healthy & going green does seem to have its benefits.